Industries today are looking for way to increase their efficiency in production without increasing their budget. This has led to the onset of collaborative robots (Cobots). These robots are programmed to work much faster than a human being and thus has become very effective. Universal Robots is a Danish company that has invested heavily in the production of robot arms for industrial purposes. The company distributes its Cobots worldwide with most of its customers being middle scale industries and organizations. The Cobots are round shaped and fitted with numerous sensors, internal wires and motors designed with two arms to ensure maximum efficiency. Reason 1: No programming Experience Required! Universal Robots produce Cobots that come with a tablet, using patented technology, for guiding it to carry out a functioning task. This allows operators with no knowledge in programming to easily use these Cobots. It is also easily hand guided to the desired direction and thus making it very efficient and reliable, ideal for any industry. Reason 2: Light-weight and Flexible. Since the Cobots are merely just two arms, they are lightweight can be easily be moved to perform different tasks and activities. It is also a bit small and thus saves a lot of space at the work place. 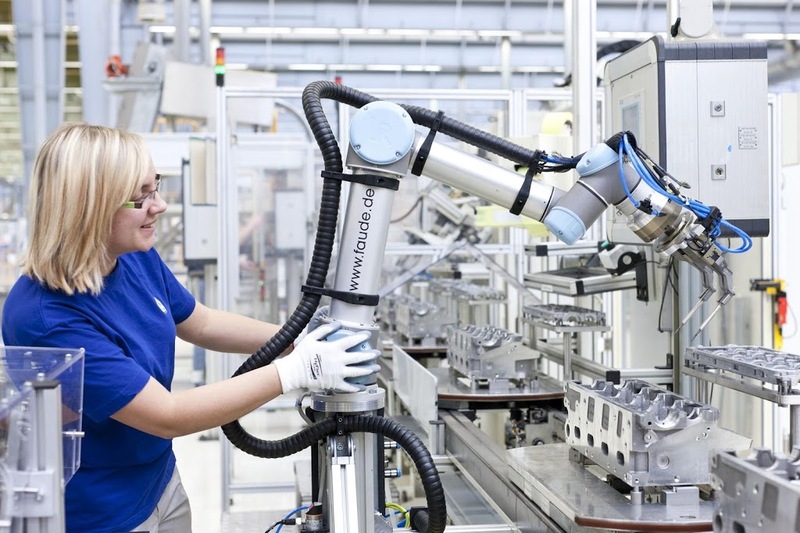 In order to carry out different tasks these Cobots can be easily re-programmed to work on different tasks incase of a change in the production layout. This allows the industry to automate most of its manual tasks and also relieve some of the works from working in unsafe conditions. The Cobots can also be modified to carry out repetitive tasks and re-use some programs to carry out recurrent tasks. Reason 3: Collaborative with operators and other Machines. Universal Robots designed these Cobots to be able to work effectively with their operators. It’s light weight and easy guiding system allows operators to master how to apply it in most of their strenuous works. It is also designed to be able to work alongside other machines to increase the production efficiency. It is also issued with a certified protection system, composing of in-built sensors, that are programmed to stop whenever they are in contact with any foreign material making it very safe. Reason 4: Easy to Setup. If you are ever worried that installing and setting up a robot may take too long, then worry no more! Universal Robots have greatly invested in reducing this time to a matter of hours! They have developed these Cobots in a way that even an illiterate worker can easily mount the Cobot and begin using it! This grants the industry ability to increase their efficiency almost immediately! Reason 5: Cost effective and fast ROI!! These Cobots have proved to conduct almost every task of the full industrial robot and without the regular programming and maintenance costs, allowing an industry to reduce the cost it uses for maintaining the robots. It also provides the fastest Return on Investment of almost 120 days! No robot has proved to be this effective so far! Reason 6: Applicable to all production Sizes. Universal Robots has enabled the Cobots to handle even the tiniest parts in production processes thereby making it applicable in industries of any size. It’s small and lightweight features makes it fit to carry out any task at hand making it very reliable. I am sure it’s hard to believe that a machine this effective can last for a long time. Universal Robots have however disapproved this belief by ensuring that their Cobots last for a long time while offering maximum efficiency. It is clear that Universal Robots have created a Robot which is here to stay. Whether you are in the agricultural and food industry, electronics and technology industry or the furniture and equipment industry, thereasons stated above are but a few of why you need this Cobots in your business. The question left remains to be; Are you ready to revolutionize your business?